5' x 9'6" G-Spec American Flags feature an elongated hoist to fly ratio and are constructed in accordance with Government specifications. 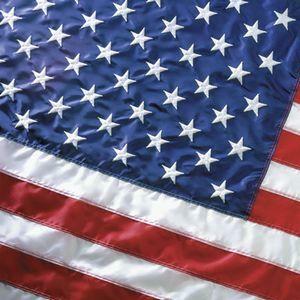 G-Spec American Flags from All Star Flags are manufactured in accordance with Government specifications. The Flags are made of 70 denier nylon fabric with lock stitched seams and color matching thread. A heavy canvas heading with #2 rolled rim, solid brass grommets. The flags are made to the official government size of 1:1.9 hoist fly ratio.